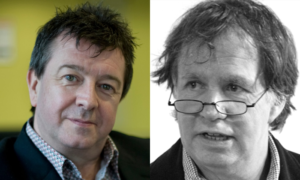 Join some of the UK’s best contemporary poets on an ideal pub crawl, guided by Stuart Maconie and Peter Sansom. This anthology will showcase a variety of new writing celebrating the British pub and everything that happens there: glass-half-full poems, early doors and last orders poems, it’s-your-round-next poems, poems so urgent they had to be scribbled on beer mats. Stuart and Peter will be selecting some of their favourite poems from the anthology to share during this event.